That's a blurry photo of the butter I "churned" yesterday using the instructions from Jennifer McLagan's Fat. Tasted against Trader Joe's butter, the homemade was sweeter, milder, and lighter. Lovely and completely different -- but not better. Both butters were delicious. 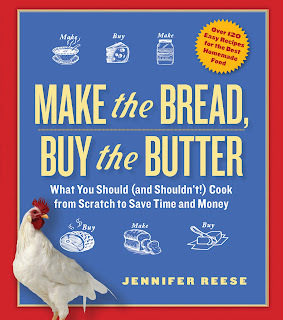 Also, unless you own a cow, homemade butter is expensive. A $3.39 pint of cream yields a quantity of butter you could buy for under $2. Still, a fun kindergarten exercise to repeat every thirty-five years or so. "You're making so many things homemade. Can't we have just ONE dairy that's not homemade? I don't want to be tasting something different for the rest of my life. I want to stick to the usual way." As for food expenditures, Mark went to Safeway today and spent $13.94 on Minute Maid fruit punch and Honey Nut Cheerios. As nutritional gatekeeper I strongly disapprove, but they don't let me carry a weapon. In any case, I'm stacking all our grocery/Starbucks/sandwich receipts here on the coffee table where I can gaze upon them every time I sit down to relax. We're at $230.52 after four days. I'll be interested, almost certainly mortified, to see the number at the end of a week. You're smarter than I am. I collected all my January receipts and am still too frightened to look in the gallon-sized bag that holds them all. It wasn't just Cheerios and fruit punch (100 percent juice by the way) that cost that $13. I know, I found the potato chips stuffed in the back of the cupboard. How could you? You know I'm helpless around potato chips.